Some wounds (any type of break in the skin) heal on their own with a bandage and a little patience, but those that don't heal normally require specialized and aggressive medical treatment. If a wound doesn’t improve after four weeks, or does not heal within eight weeks, it is considered a non-healing wound. Non-healing wounds can cause deeper skin erosion, infection and complications which can be damaging to organs and limbs, and can even be life threatening — especially for those with diabetes and heart conditions. Desert Springs Hospital’s Wound Care Center was awarded the Robert A. Warriner III, M.D., Center of Excellence Award by Healogics for its expertise in healing chronic wounds. Typical treatments include removing unhealthy tissue, oral medication as well as topical solutions. The team also provides evaluations for those who have been recommended for amputation. 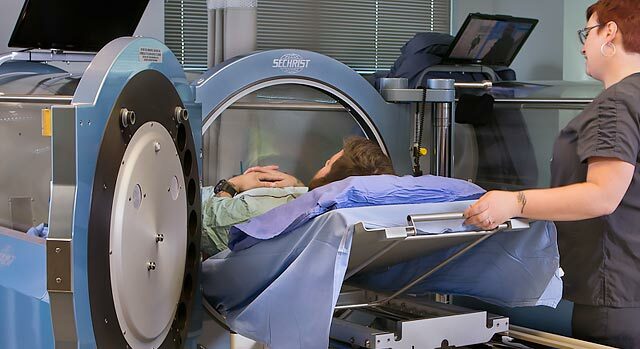 Wound care is a key component to limb loss prevention and in some cases, hyperbaric oxygen therapy can help prevent amputation. To make an appointment at the Wound Care Center at Desert Springs Hospital, call 1-702-369-7571. If you need a referral to a wound care specialist or other physician at Desert Springs Hospital Medical Center, call our free physician referral service at 1-702-388-4888. Conditions that respond most favorably to HBT are bone infections that do not respond to standard treatment, crush injuries and reattachment of severed limbs, deep tissue injury from radiation therapy, peripheral artery disease and skin grafts or flaps that are not healing. HBT is available Monday through Friday at the Wound Care Center at Desert Springs Hospital. Sessions last about two hours and patients can listen to music, watch TV or take a nap while in the chamber.